Located in downtown San Luis Obispo's historic core and the heart of California’s Central Coast, Garden Street Inn offers old-world hospitality with new-century passion. Locals call it SLO; offering excellent shopping, first-class restaurants, wine-tasting, art galleries and museums. Surrounded by the natural beauty of the rolling hills and coastal valleys, SLO lies just a short drive from Avila Beach, Morro Bay, and Pismo Beach. Golf, tennis, biking, and hiking opportunities abound. SLO hosts a myriad of local tourist attractions, including world renowned vineyards and wineries, California missions, iconic museums, and breathtaking beaches. Classic decor reflects Victorian charm in our uniquely boutique hotel - many with fireplaces and private decks. Grab a book from the well-stocked Goldtree Library, or sip your morning coffee on our spacious outdoor communal deck. Meet the chef in preparation of a delicious breakfast each morning which is served in the McCaffrey Morning Room. All of our guest accommodations are uniquely curated with beautiful decor, fabrics, and stunning lighteliers. Each room features a wardrobe, a spacious bathroom, LCD TV, and a queen size bed. Suites also include a parlor room. Select rooms are pet friendly (Click here to view our pet policy). 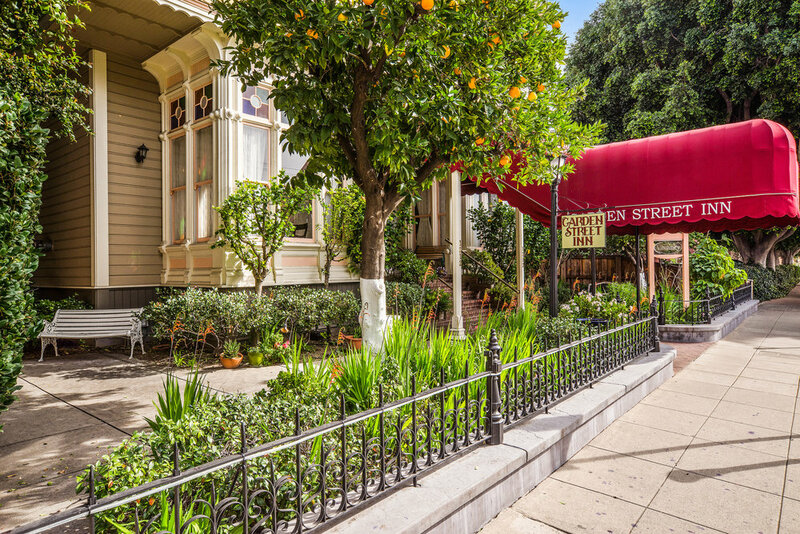 This 1887 Victorian home, known as the Garden Street Inn, rests on land that was once part of the Mission Vineyard. The Italianate/Queen Anne design was originally the single-family home of German/Jewish immigrants, Morris and Helena Goldtree. After changing hands to several different owners, the property was purchased in May of 1989 and converted into a bed and breakfast. In 2018, Kirkwood Collection became stewards of Garden Street Inn, expanding our collection of first-class hospitality. Click here to read more of our history! Named for Elizabeth and Patrick McCaffrey, who purchased the home in 1898, this sunny room is the setting for a delicious gourmet breakfast featuring historic Inn recipes. Named for Helena and Morris Goldtree, who built the house in 1887, the Goldtree Library is well appointed and the perfect place for pleasantries and conversation. The Luck of the Irish flourishes with Shamrocks and Lily of the Valley décor. This room is located downstairs and features a private deck, queen size bed, and the enjoyment of bathing in an old-fashioned Clawfoot tub/shower. Pet friendly. Jack London lives! The spirit of the West is captured in warm shades of tan, rust, and green tucked away in a secluded corner of the Inn. This room is located downstairs, has a queen size bed, and an antique Clawfoot tub/shower. Thoreau's beauty of nature emerges in the green of the forest, leaves of tan, and serenity of blue shining waters. Expansive windows look out onto a massive deck. This room is located downstairs and has a queen size bed with a large bath/shower. The Sound of Music comes alive within this Austrian themed room. The fireplace is original, although the tile was added later (due to state and local regulations the fireplace is non operational). The antique Clawfoot tub dates back to the early 1900's. You will hear the crowds cheering as you delight in memorabilia of the sporting world of yesteryear. Gather 'round the fireplace or enjoy views from the expansive deck. This room is located upstairs and has a queen size bed and an antique Clawfoot tub/shower. Classic warmth in blue and mauve grace a sitting room with exceptional views. Yesteryear's stately pocket doors separate the bedroom. This room is located upstairs, has a queen size bed, beautifully tiled shower with glass doors, a couch, and a 27" flat screen television. Romantic hues of an English Garden design surround an acclaimed Picasso print, The Lovers. A private deck adjoins a secluded master bedroom. Bathing pleasure abounds in a Jacuzzi bath/shower. This room is located downstairs, has a queen size bed, and a 27" flat screen television. This room is wheelchair accessible with an outdoor lift. Pet Friendly. A cozy cast-iron stove warms the sitting room focusing on the beauty and old-world charm of classic cars. Shades of burgundy, tan, and red combine with grand pocket doors. This room is located upstairs, has a queen size bed, beautifully tiled shower with glass doors, a separate seating area, a 27" flat screen television, and features an antique Clawfoot tub/shower. She nurtured this grand dwelling from 1923 until her death in 1965. Her spirit lives on in gold, lavender, and black architectural decor around an ornate fireplace. Original stained-glass windows and a soaking bathtub/shower are added features. This room is located downstairs, has a queen size bed, table with chairs, loveseat and a 27" flat screen television. The Garden Street Inn is 200 miles north of Los Angeles, 92 miles north of Santa Barbara, 32 miles south of Cambria/ Hearst Castle, and 230 miles south of San Francisco on Hwy 101. Morro Bay is less than 15 miles away to the west of Garden Street Inn. The Inn is just a 10 minute walk ( 0.5 mile) from the San Luis Obispo Amtrak Station. Take Marsh St. Exit driving north on Marsh (a one-way street) for six blocks; turn right on Garden Street - Inn on left hand side. Traveling south on Highway 1, as you enter the city limits Highway 1 turns into Santa Rosa Street. Continue on Santa Rosa Street for approximately 2 miles. Turn right on Pacific Street. Proceed 4 blocks and turn right on Garden Street. The Inn is located on the right hand side. Bicycling is a very popular way to get around SLO, with some great bike trails both in the city and the surrounding areas. If you'd rather leave your bike at home, we can arrange for rentals. During your visit, you are welcome to use our bike rack located on site. Click below or call reception to make a reservation at one of these exceptional restaurants.